It is about 15 km from the motorway exit to KAUPP in Sulzburg. From the motorway A5, take the exit for Bad Krozingen and drive east. Continue for approximately 10 km straight on to the first crossroads at the entrance to Staufen. At this junction, turn right towards Münstertal until the junction Ballrechten-Dottingen/Sulzburg. Turn right. In Ballrechten-Dottingen, turn right again towards Sulzburg. 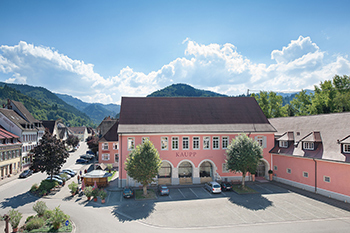 When you arrive in Sulzburg, you will find Auktionshaus KAUPP in the centre of the marketplace.